The Notorious Newman Brothers is a new film from the Butler Brothers, but not by the Butler Brothers. This is an important distinction. Their last film, Confusions of an Unmarried Couple, starred Brett Butler and was directed by him and Jason. Brett starred. Of his performance in that film, I said, "He speaks excitedly in a thick Canadian accent, rattling off profanities, and operates almost completely by his own single-minded ethos. As an actor, he's serviceable, but as a screen presence, as a character, he's a delight to watch." The film itself was flawed, but enjoyable, and considering they shot it in a weekend for $500 (Canadian), you can't really ask for much more than that. Which brings us to The Notorious Newman Brothers. 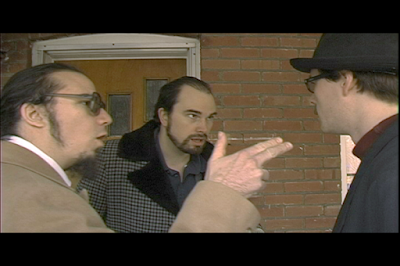 Here Brett stars as Thunderclap Newman and Jason as (naturally) his brother Paulie. They're mafia bigwigs, involved in all sorts of high-end mafia-type business, and have numerous expensive houses and cars and women, none of which are shown on-screen. Instead we see them in a house that I assume is where someone working on the film lives. And once again, the film is carried by Brett Butler's performance. His Thunderclap Newman is a deluded, wickedly funny, force of nature. More than ever I'm convinced that Butler, given the right opportunity, is a star just waiting to happen. He's rough around the edges, sure, but he's a gem. I'd love to see what an accomplished comedic director could turn him into, given the right supporting role. If he were in the next Judd Apatow film, I'd camp out for tickets. I don't see why he couldn't have Judah Friedlander's career. The premise is this: mafia kingpins Thunderclap and Paulie have hired filmmaker Max Chaplin (Ryan Noel) to follow them around and document their lifestyle for reasons I've forgotten, but aren't all that important anyway. Max, who under the pretense of being undercover wears a obviously fake mustache, is to our eyes as much a filmmaker as the Newman Brothers are mafia bosses. There's pretty much zero evidence that Max knows what he's doing as a filmmaker. I think this is on purpose. What Ryan Noel (who also directed) attempts to do here is make the film look like it's being made by a bad documentary filmmaker, but there's a couple of missteps. First, he's got a crew following him, but there isn't really a point where the crew (especially the camera operator) is as inept as Max is. And second, there's two ways to make a bad documentary. You either don't know what the hell you're doing and the film is nearly impossible to watch for technical reasons or you make it look like you don't know what the hell your doing while covering up all the technical problems that most audience members won't notice anyway. I think Noel is trying to walk a line here between the two methods, but too often he ends up in the former. The most egregious example being a long, long scene in a kitchen where an entire white wall is being blown out by the sun coming through a window. It's painful to watch. Add to the fact that Noel's Max Chaplin speaks in a whiny, high-pitched voice that makes him more annoying than pathetic. You're glad when he's not in a scene. All of which makes me wonder, what exactly does Noel bring to this equation? I've seen what the Butler Brothers can do as writer/director/actors and I don't see where Noel's doing anything they can't do better themselves. As for the film itself, it veers pretty wildly between being hilarious and painful. It's not as good as Confusions, but there are moments that are very good, moments inspired enough that you're excited by what might come next. Think of this as one step forward and two steps back. But when the film is clicking, when everything is working, it has the potential to be one of the funniest things you'll see all year. But when it's not, when the jokes aren't working, you'll wonder what else is on. For me, the best parts are most inappropriate. They're at their best when they push the limits of R-rated humor. The version of the film I saw is six minutes longer than the version currently showing at festivals, so I hesitate to talk about the script, which I felt needed some tightening. It's entirely possible that's been addressed. But without getting into details, one thing I found interesting about the script is how the third act retroactively fixes the first two. There's things throughout the film where I'm just sitting there going, "But...um...", things that don't work at all, that fall completely flat. Then, after the reveal, they make a lot more sense. Do they all work retroactively? No. But a lot of them do. It's an interesting approach, and surely risky, something I bet they don't recommend in the screenwriting books. And that's one of the things I really like about the Butler Brothers, how they're able to approach their films from a different angle than you'd expect. They work on the thinnest budget imaginable, and while that costs them a lot of polish and finesse, they more than make up for it in creativity. Take Thunderclap and Paulie. Most low-budget filmmakers, when trying to show mobsters, make the mistake of trying to hide the fact that they don't have a proper budget to do a mob movie, but the Butler Brothers flaunt the fact that they don't have a budget and thereby turn a liability into an asset. I don't know much, but I know the house of an indie filmmaker when I see one. Why is he undercover? Beats the hell out of me. The subplot is pretty much dropped, but the mustache isn't. I assume this is not Noel's actual voice. If it is, apologies. This cost $500 Canadian. Depending on when they shot it, that equates to anywhere from $500 to $500,000 American. Thanks for following Psychotronica. I am now following 100 Films.